Yankees Mustaches Fueling Winning Ways? If you have been watching baseball (and the Yankees) lately, you may have heard the team has been doing quite well of late. In fact, going into last evening’s game against the Orioles, the Yanks had gone 15-5 since losing on Jackie Robinson Day. After last night’s win, they improved to 16-5 over that time. What could possibly be fueling this run of good play? It’s gotta be the mustaches. 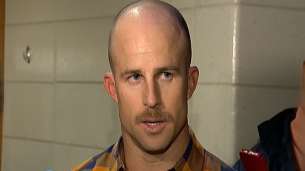 Several weeks ago, Brett Gardner, their left-fielder and wearer of high-cuffs, began growing a mustache (it’s since begun to fill in nicely) to break out of a slump. It worked, and the Yanks started winning too. Perhaps as a “team bonding exercise” or perhaps because the play was improving, a number of Yankees also began growing mustaches, and the winning ways have continued. So the team is keeping the mustaches. Now, teams doing something with facial hair and streaks is nothing new — in the NHL, the “Playoff Beard” is basically required. You also had the Red Sox doing that whole long shaggy beard thing a couple years ago. So, the Yanks aren’t exactly breaking new ground here. But they are kind of being rebellious. The Yankees, as you’re probably all aware (or should be), have continued a Steinbrenner-era dictate that no player can have facial hair other than a mustache. No beards, no goatees, not even well-groomed ones. So, while what the Yankees themselves are doing isn’t unique, that the prim-and-proper Yankees are going a team-wide mustache bonding thing is unique, and newsworthy. In fact, several different media outlets, including both local and national, have picked up on the story. You’ve even got some bloggers ranking the mustaches. And it’s not just bloggers rating them either. Wow. Is this really something all that newsworthy? Apparently so — but the bigger question is: if the Yankees weren’t winning (but were, for some other reason, group-mustaching), would anyone care? Is the streak simply coincidental or do the media (and fans), and more-importantly, the players, think the streak is a by-product of the mustaches? Crash Davis: I never told him to stay out of your bed. Annie Savoy: Yes you did. Crash Davis: I told him that a player on a streak has to respect the streak. Crash Davis: You know why? Because they don’t – -they don’t happen very often. Crash Davis: If you believe you’re playing well because you’re getting laid, or because you’re not getting laid, or because you wear women’s underwear, then you *are*! And you should know that! So if the Yankees are on a winning streak, and it’s because of the mustaches, they have to respect the streak, right? And Yankee management, so long as the mustaches are kosher, has to go along with it, right? What do you guys think? Is there anything at all to the mustaches and the streak (or playoff beards, or wearing women’s underwear) … or is it all just purely psychological? Or is it more — do things like growing facial hair, or all wearing stirrups, or whatever actually cause a team to play better? Could the ‘group-think’ employed in these cases actually help gel a team? Have any of you ever played a sport (or been in any situation, office, school — whatever) where you and your teammates/co-workers/classmates all acted in a similar manner and it caused a win, or other positive result? I’m not buying that the Yanks (or any team) is winning because (or even in spite) of the facial hair, but it sure seems to be working. What do you guys think? This week we visit a mid-twentieth century Midwest ballpark with a unique history and a mammoth scoreboard. Opened: April 1956. Last baseball game: September 30, 1981. 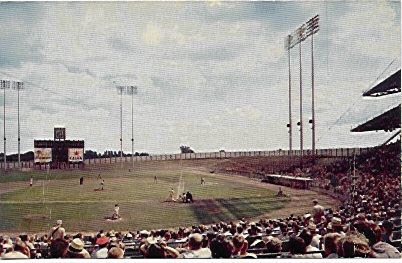 Raised up from farmland south of downtown Minneapolis, Metropolitan Stadium was the home for the Minnesota Twins (and Vikings) for twenty-one seasons. More commonly known as the Met, or the Old Met, it retains a special place in the memories of Twins’ fans. The interesting and complete history of Metropolitan Stadium is covered in this SABR article. Met Stadium closed after 1981 pro football season and sat vacant for several years before demolition in 1985. The site is now occupied by the well known Mall of America. Inside the Mall you will find commemoratives of the Met, including a plaque marking the location of home plate. For a comprehensive historical retrospective of the Met, including a great collection of images, you may want to visit this tribute to Metropolitan Stadium. 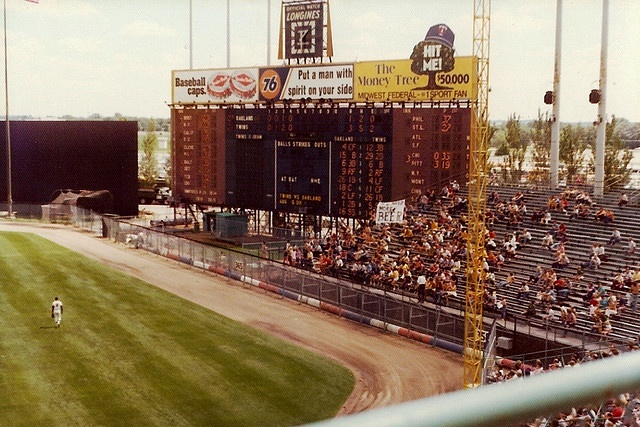 The scoreboard was a prominent part of Met Stadium from the initial years when it served as the home field for the Minneapolis Millers. This photo shows the initial configuration with large advertisement panels (Grain Belt and Gluek beer ads?) flanking the center section. And, of course, that ubiquitous Longines clock. When the Twins arrived in 1961 the scoreboard layout was reconfigured to include AL and NL games scores. Advertising panels were placed along the top. Photos show the center section was initially painted black. At some point in the 70s the center section color became blue. Although I found no information concerning the scoreboard manufacturer, many of the design details (such as the matrix display panels) and layout are similar to those found in Connie Mack Stadium and Yankee Stadium during this time period. The illustration depicts the scoreboard during the last home game of the 1978 season. It was, unfortunately, HOF member Rod Carew’s last home appearance for the Minnesota Twins. • Several years prior to becoming the Twins, the Washington Senators played the Phillies at the Met in an exhibition game during the 1958 All-Star break. • The Chicago Cardinals played two home games in Met during the 1959 NFL season. • Met Stadium was the first baseball stadium (or one of the first) to utilize cantilever construction design. This approach avoided the use of support columns that obstruct views of the playing field. • The Twins O Gram message board section of the scoreboard was a mainstay from the beginning. The operation is described here. Twins-O-Gram! Scoreboard messages live on in the current Target Field. You can purchase your own personal message for a mere $77. • The Twins were reportedly the first ballpark to display home run distance. Distances were estimated using a table covering the location of outfield seats. • In the late 60s and early 70s, Midwest Federal was a scoreboard advertiser. Players hitting the adverting sign atop the scoreboard would have won $50,000! I guess no one ever collected, but on July 5, 1969, Reggie Jackson did hit the scoreboard with a 500-ft plus bomb. When the American League expanded to fourteen teams in 1977, the Met scoreboard seemingly did not follow suit. Photos of the scoreboard just prior to demolition appear to show the AL scores configuration unchanged from twelve teams. The bottom portion was normally used for listing the game umpire crew. It would be interesting to know how the “missing” AL game score was handled. Classic Scoreboards next stop is a visit to a ballpark celebrating a centennial anniversary. I’ve been a Uni-Watch reader / fan for a while now and I’m always fascinated by the tweaks and concepts that people submit. I’ve also been running a fantasy baseball team ”“ the Piklor Dills – in the Greater O’Hare Baseball League (GOBL) since 1984 (one of only three remaining original members!). To commemorate a (rare) championship season a couple of years ago I whipped up a concept of what our uniforms would look like. I’d love to know what you think! (The lettering in the league logo changes every year to match the champion’s colors from the previous season). I’ve also attached my team logo / sleeve patch from that year and 2015 as well as a 2013 concept for my brother’s team, the London Werewolves. I’ve always loved the site, thanks for all of the great content! I was at the Warriors/Bucks game with a buddy last night and we started talking about the Bucks logo and how it could really use a refresh. I drew this up today during my lunch break, thought I’d pass it along! The color scheme remains the same, but we lose the actual “buck” in exchange the more modern antlers interpretation. Stronger type treatment, complete with a reference to the long history of the franchise. Simple, clean update. I’m not even a Bucks fan, just love this type of stuff. What do you think? these posted on Uni Watch. If you have any more questions, you can reach me at this email address. Baseball News: Here’s a pretty solid look for Maryland baseball, unfortunately there is the awful logo placement on the stirrups (nice spot by 213 Miles From Shea). … After a couple decades of fakes and ripoff *authentic* home runs balls and other MLB items sold to collectors, the MLB now has an “authenticity police” force stationed in MLB parks throughout the leagues (from Tommy Turner). 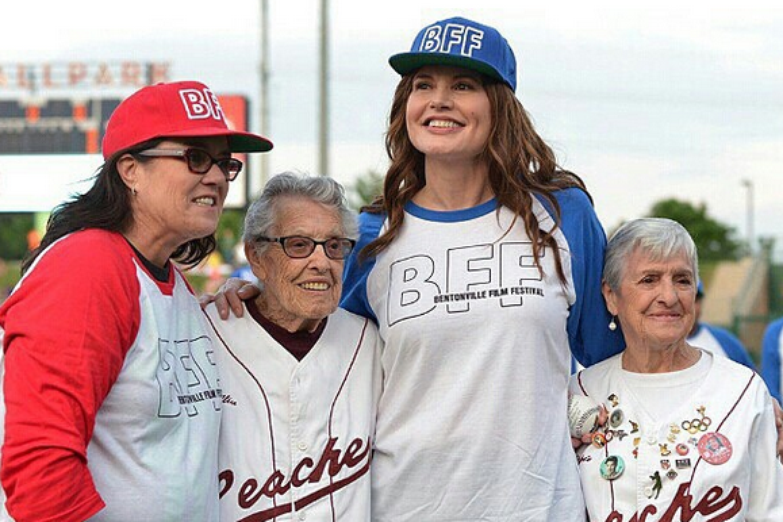 … Geena Davis and Rosie O’Donnell had a League of Their Own reunion Thursday — here’s a bit more on that. … Great article from Jesse Spector on there not being enough Twins players on the field during the playing of the Star Spangled Banner. 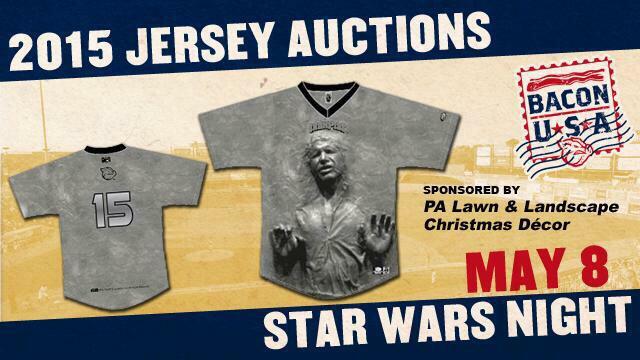 … Star Wars night for the Iron Pigs last night, and this was one of the more clever jerseys. 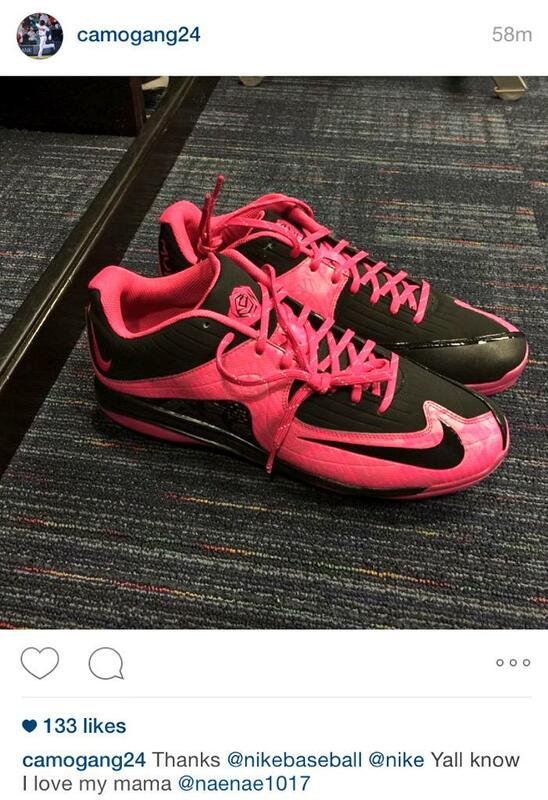 … Here’s a sneak peek of the Braves’ Cameron Maybin’s pink Mothers Day cleats (h/t Mike Nessen). … “The Kansas City Royals posted the attached photo of Dennis Leonard from the 70s in honor of his birthday this afternoon,” writes Adam Franz. “I’m assuming he is wearing a BP jersey because the photo looks to be taken at Royals Stadium. Is there any precedent for the Royals wearing solid tops for home games before 1994? I thought the numbers on the sleeve were unique for any Royals jersey.” … Nice follow-up e-mail to Paul’s lede yesterday notes, “I got an email from the Angels today (while I’m a Dodgers fan I live in Orange County and go to Angels games on occasion) that says, ‘This Is The Cap of 30 Teams, 27 Cities, And 1 Nation,’ writes Chris Cruz. “Cap design aside (which you’ve already covered), someone forgot to tell Canada that the US has annexed it. Someone also forgot to tell MLB that even though the Angels’ formal name is the ‘Los Angeles Angels of Anaheim,’ there are indeed 28 cities hosting MLB teams as Anaheim is it’s own distinct political entity (it’s even in another county). Shameful stuff all around.” … Well, it had to happen sooner or later: Last evening in Philly, the Mets wore their alternate road blue unis (which have a special cap with a silver interlocking NY), and sure enough, injured pitcher Dillon Gee had on the wrong one (thanks, Paul). … The El Paso Chihuahuas wore pink camo jerseys last evening (via Aaron Rich). … Looks like Phillies catcher Carlos Ruiz wears a helmet with a different number than his uni number (h/t Matt Connelly). … Last night, both the Isotopes and River Cats wore black softball tops (via Kenton Bevacqua). NFL News: You know all those veterans we see being honored on the big screen at NFL games? Well, the National Guard has paid NFL teams millions to honor veterans on the Jumbotron. And here we thought the NFL was pandering saluting them out of the goodness of their hearts. Here’s a bit more on that (from Tommy Turner). … Do we have a ‘leak’ letting us know the Dolphins new alternate jersey will be orange? (h/t Tom Ferrer). And this tweet is cryptic, but is it possible the Dolphins will reveal the alt jersey today (h/t Preston Feiler)? 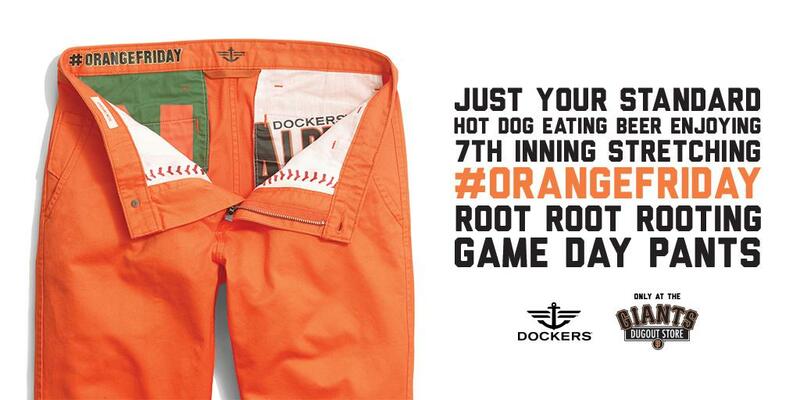 … I’m pretty sure we covered this last year, but apparently Dockers sells Game Day rooting pants for the Giants. 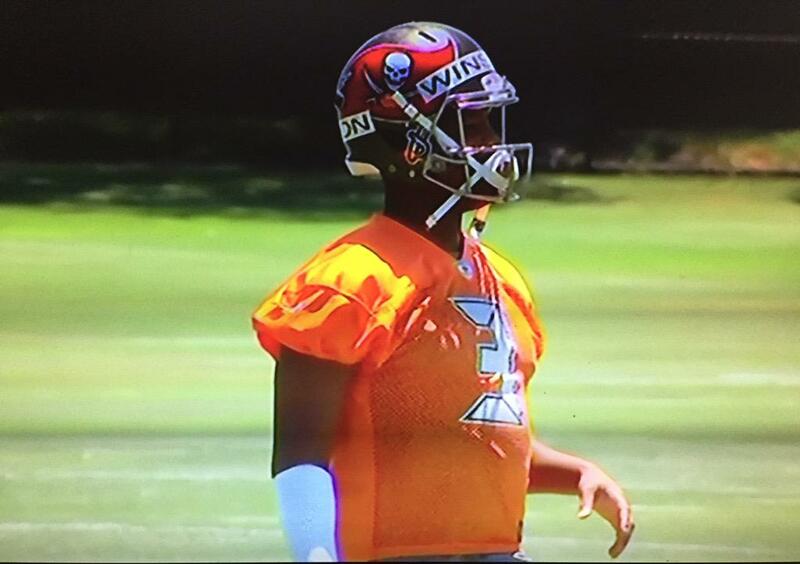 … Here’s a look at Jameis Winston in Bucs’ gear (from Matt Fedorka). … “I guess Lids hasn’t gotten word that the Browns #1 pick had a number assigned to him already,” writes Tony Crespo. “So they photoshopped ‘TBD’ on a blank jersey.” … A few veteran Seahawks have changed their jersey numbers, and the new crop of draft picks and UDFAs have been issued their digits as well (from Kyle Hanks). … I’m not 100% certain when or why Gronk was given a cake, but the sleeve of the cake has a Reebok logo (via Brenton Giordano). Basketball News: Here’s a team with a a very interesting name (via Paul). Check out the awesome stirrups that go with it! Soccer News: Great article by Travis Waldron on how the DC United soccer team will be working with DC Vote, an organization that advocates for full Congressional representation and budget autonomy for the District, to discuss a collaboration on a design for the team’s 2016 primary jersey. … Split scarves, or scarves that have the names and crests of both teams competing in a given soccer match, are raising the hackles of many fans (thanks to Tommy Turner). Grab Bag: Here’s a nice little piece on the evolution of women’s athletic uniforms. … Reprinted from yesterday’s comments: Bit of a mascot drama at Rutgers, as reader DenverGregg points out “The university will add add homosexual, female, transgender and multiple racial incarnations of the Scarlet Knight to more accurately represent the student body.” … We don’t usually link to Politico articles, but this one that notes President Obama’s choice of Nike for pro-trade speech stirs controversy is uni-notable. …”When I saw the Farm Safety announcment on Donegal’s jerseys I noticed that the shirt has the three stripes but no Adidas logo,” says Stefan Schubert. “I first thought that was due to the special jersey so I went to their website, only to find out that the outfitter indeed is not Adidas but O’Neills Irish International Sports Company. Their stuff looks like it came direktly from Herzogenaurach WOW. Never thought a sporting goods giant such as Adidas would let that happen. I googled the issue but could not come up with much. 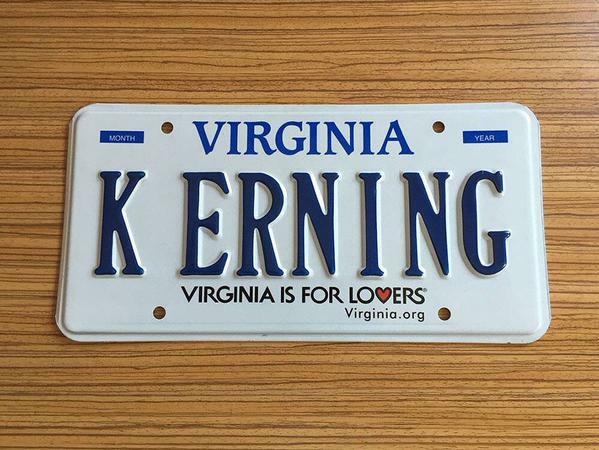 Here is something I found in a forum.” … Is this the best license plate ever? I vote yes (h/t Brandon Moore). Thanks going to do it for today. Thanks to Gary, Alex and of course, the concepters, and anyone who tweeted or e-mailed in. I will catch you guys tomorrow. Have a great Saturday. Follow me on Twitter @PhilHecken..
41 comments to Yankees Mustaches Fueling Winning Ways? You have to be SEEN shaking hands and kissing babies. Re the UConn set: Is there a term for “sideways word down the thigh” word, and what sport had it first? My slapdash Googling shows this Honda MotoGP in 1982. The NHLs greatest draft pick of all time practiced this! But seriously, pretty sure a dark colored helmet with the white jersey was pretty common back then. When helmets were first coming out, I believe they weren’t worried about getting TWO helmets. Val James wore a blue lid with the Americans’ whites. The capitals wore red helmets with white jerseys for a year when they added the throwback. Then, of course, Pittsburgh wore yellow helmets with white for a short time. Johnny in Slap Shot even wears a blue lid with the whites. (I know its fiction…but it was a lot of real hockey players.) I’m not positive of all this, but I think this happened a decent amount when helmets were first making their way into the NHL. The Islanders had white helmets for that 1979-80 season for home games (including Tonelli, who wore a white helmet as he assisted on the Stanley Cup winning goal). In fact, the Isles always had home white helmets since their inception. Either it was a mishap that prevented either Tonelli or the team from wearing their white helmets that night (I would imagine they all had to wear the same, blue or white), or it was a tribute to the upcoming USA Olympic team, who wore blue helmets with both their white and blue sweaters (notice the Olympic patch on Tonelli’s sweater- Both the Isles and Sabres wore the patch for the entirety of the 79-80 season). Took me a long moment to finally see it. Novel use of an unconventional font, in any case. Must be something Carlos Ruiz and Phillies pitcher Jon Pettibone (#44- on 60 day DL) have going on. A mistake maybe? Having a lineup that’s hitting, solid starting pitching, improved defense, and arguably the best bullpen is baseball is probably the real reason for the Yankees winning. That said, the mustaches started when the winning play started, so they must continue! Do not mess with it. If the team members believe this to be the case, then they’re probably correct. Great job with that scoreboard Gary. A lot of details in that picture. But from 77 on, there’d be seven AL games. Five can be shown on the left side of the scoreboard, the sixth is playing at the Met. Still leaves one. ..but you really shouldn’t have all four of those at once. What Tampa Bay is doing is also happening in Nashville. I know multiple people who were declined the ability to buy tickets to the Hawks Preds series in the playoffs because their credit card zipcode was from Chicago. And here we thought the NFL was pandering/saluting (veterans) out of the goodness of their hearts. Well, Lord knows we can’t have that. If we start honouring veterans, they might go out and start more wars and stuff! That’s actually what happens when you keep honoring *politicians*. I probably shouldn’t be carrying over yesterday’s comments, but one from late last night was beyond ridiculous. Patrick, I really don’t know the politics of everyone who posts here on this site, but I seriously doubt that too many Americans hate our military. In any case, consider, for a moment, my position that to argue against camouflage in sports uniforms is actually the conservative point of view. Memorial Day, in the United States, has existed (in one form or another) since the aftermath of the Civil War. For much more than a century, this solemn observance went on without *any* Major League Baseball teams donning camouflage uniforms. But now you feel that we are suddenly unable to honor those who died while serving in the armed forces unless we can watch athletes wear pretend soldier uniforms while being paid millions of dollars a year to play baseball. Why did we have to change things? What was wrong with all those Memorial Days in the years *before* baseball camo? Your parents and grandparents hate America, obviously. Phil I think you may have answered your own question with the Bull Durham quote. If you’re on a streak, respect the streak. With finding out that the NFL gets paid by the Department of Defense for “the salutes and other advertising” for the military at NFL games, (Boy, this is going to make a lot of people mad, but…) I wonder if the NFL gets paid for Breast Cancer Awareness during the month of October too? Keep in mind that the paid-for scoreboard salutes by individual teams are different from the league-wide GI Joe-vember program, which is a closer equivalent to Pinktobe (and I imagine pink merch is profitable without government subsidy). Although there’s the flipside of the issue: why should private entities be expected to provide free marketing services for a government agency’s recruitment drive? These teams already pay taxes. Scoreboard quibble, the Met’s scoreboard never had the bulb configuration to show “DH” as a position, so it just showed a second column “B”. The position columns were programmed only for letters/numbers of the fielding positions: P, C, 1B, 2B, and so on. As far as I remember this was never updated. Thanks for your input. I never found photos (with sufficient detail) of the scoreboard during the designated hitter era. My go-by was this photo during a Vikings game that shows the matrix configuration. (http://www.ebay.com/itm/METROPOLITAN-STADIUM-SCOREBOARD-FANS-SITTING-BY-IT-MINNESOTA-VIKINGS-1970-/201003501731). It would have been possible to display DH or at least the D,but I guess they chose not to program these letters. So for DH only B was displayed? That’s how it was done with the old scoreboard at old Comiskey, as well. Growing a mustache is always the correct thing to do, independent of any perceived effect on the team’s play. On that I will agree. As for “respecting The Streak”? Pffffft. You think The Streak respects you? No way. It comes and goes as it pleases. Just when you think you and The Streak are getting along so well, you wake up all alone without so much as a note on your nightstand. Meanwhile The Streak has moved on to someone else as if your time together meant nothing. Nothing. Sure, enjoy your little fling and treasure it in your heart, but that’s all it is…a fling. You live your life and you grow your mustache, but if you feel like shaving it, shave it. Now if you’ll excuse me, I’m going to look for a foul line to step on…or maybe an opposing team’s pitchers mound. No orange alt reveal today for the Fins. They did show a 50th season patch. Just noticed that the Game Day rooting pants in the NFL section of the ticker are for the baseball Giants, not the football Giants. Not surprising, given the Dockers / Levi Strauss / SF connection. While the camo may be an MLB-initiated thing, the “30 teams, 27 cities, 1 nation” slogan is New Era’s, as evidenced on their own website. So blame New Era for that part of it. 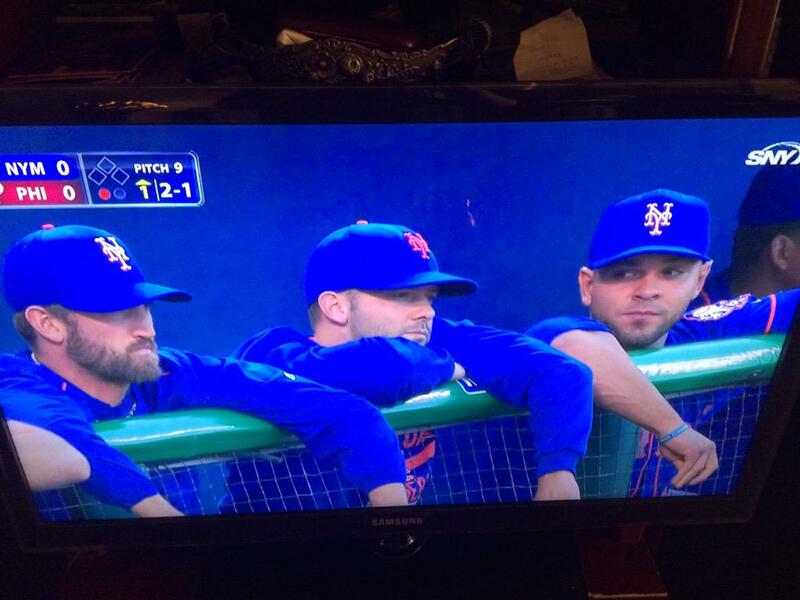 Dillon Gee was the ONLY Mets player wearing the correct cap last night as far as I’m concerned. Kerning is the spacing between letters. The letters on that plate aren’t evenly spaced (especially around the K and perhaps the I), so it’s a bit ironic. Plus the idea of kerning itself is just cool, so it would be neat even if it were correctly done. Kerning refers to spacing around lettering. It’s one of those things that once you see bad kerning, it’s hard to unsee. Like this. Uconn really needs to take a page from Colorado.. The new uniforms stink! Sorry, they just do. I kinda liked the concept but still hate the husky eyes on the helmet. Dolphins will wear a 1966 throwback against the Giants on MNF. Team will say whether it will be aqua or white in July and will sell a version to fans. Minor quirk in the site: sometimes I’m reading text and my browser jumps to a video ad for a major coffee retailer. Is this supposed to happen on Firefox? It’s affecting my UX. The reason John Tonelli – and all of the Islanders – wore blue helmets on October 16, 1979, from the New York Times (and once I read it, I remembered it from when it happened) – Goalie Billy Smith had only a blue helmet available. The Flames complained that he was wearing blue helmets and the other Islanders were wearing white (even though their red helmets did not clash with either). So rather than take Smith out of the game, all of the Islanders switched to their blue road helmets. Wow. That is one ridiculous argument. Though, I guess since the helmet rule had just gone into effect, we shouldn’t be surprised that such shenanigans could happen back then. O’Neills have got some simple but attractive jerseys on offer. Every county has a unique look and every county gets their uniforms from O’Neills. No Nike or Puma there. Fun fact : O’Neills will not sell a kit that has the three stripes pattern to a non-Ireland address. I’ve ordered hooped socks and another football club’s jersey (sans striping). That being said, I own a gorgeous Kilkenny kit but it was purchased in Dublin.